Hospitals are collapsing. The debts of hospitals are more than 50% of their annual revenues and the Association of Suppliers expressed that their claims are unpaid for more than 400 days. The government refused to increase the resources for healthcare due to an austerity package of the state budget. In order to maintain the remaining popularity, the government persistently refuses to introduce user charges for hospital stay. In a university hospital, the suppliers of utilities were forced to stop the delivery of electricity, heat and water. The management of the hospital got into a desperate situation, because of freezing weather conditions. Due to this, patients were transported 30 kilometers to a private hospital, where they had to pay daily fees for admission. All patients except of the pensioners accepted this situation. 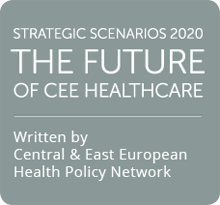 For full version of the Strategic Scenarios 2020: The Future of CEE Healthcare see pdf.